Performers include: Olan Rogers, Fred Armisen, Tom Kenny, David Tennant, Tika Sumpter, Steven Yeun, and Coty Galloway. From creator Olan Rogers, the Final Space TV show is an animated sci-fi comedy. The story centers on Gary (Rogers), who has been imprisoned upon the Galaxy One for five years. While working off his sentence, Gary meets a little green alien (Rogers), who reminds him of a childhood pet, so he rescues the little fellow and names him Mooncake. The connection between two two is instant. What Gary doesn’t realize is that his cute little buddy is a planet destroyer — wanted by the evil Lord Commander (Tennant). Naturally impulsive and carefree, when Gary was first sentenced, he was something of a two-bit scammer. Meanwhile, Mooncake is perhaps the most powerful weapon in the universe. Oddly enough, the devotion between these two could just change the universe. As short on time as he is in stature, the Lord Commander is arguably the most perilous being in the galaxy. Since Mooncake is the only thing that can sustain his life. the Lord Commander is pulling out all the stops to get him. Keeping everything ship-shape on the Galaxy One is HUE (Kenny), the craft’s artificial intelligence. Although HUE is smarter, Gary often fails to heed HUE’s advice, usually to his own detriment. There’s also “Kevin” — actually KVN (Armisen) — Gary’s “Deep Space Insanity Avoidance Companion” aboard the Galaxy One, who ironically enough drives Gary crazy. After five years, Gary is still hung up on Quinn (Sumpter). His long-ago efforts to impress her are what landed him in the clink. After she discovers a rift in Time/Space, she swipes a space ship, in order to investigate. Unfortunately, her rogue mission hits a bump upon the arrival of Nightfall — a new version of herself, back from an ominous future. Soon after finding Mooncake, Gary collides with Avocato (Galloway), a space feline of the Han Solo mode. While Avocato is competent and well-trained, he’s a little short in the dependability department. Still, this might be the beginning of a beautiful friendship. His son, Little Cato (Yeun), has been the Lord Commander’s prisoner for years and has sworn to reunite with his father, at all costs. Deep inside Gary, there may just beat the heart of a hero. Will his adventures bring it out or beat him down? Stay tuned. What do you think? Do you like the Final Space TV series? Should this TBS TV show be cancelled or renewed for another season? 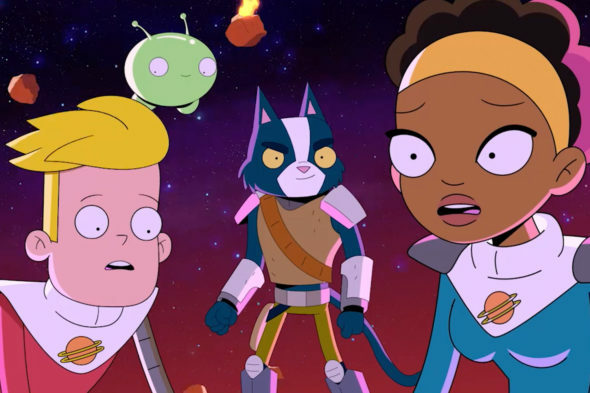 More about: Final Space, Final Space: canceled or renewed?, Final Space: ratings, TBS TV shows: canceled or renewed? Please renew. I haven’t had a can’t wait for experience week to week waiting for Final Space since Firefly and South Park and Lost In Space. Final Space is an instant Classic and a pure addiction. Renew it. Renew this show as much as possible because I just got into it. I love the characters so much.